"I am my beloved's and my beloved is mine" - the famous words from Song of Solomon 6:3 in the King James version of the Bible are engraved in a black-antiqued finish on this heart necklace in .925 sterling silver, from Apples of Gold Jewelry. 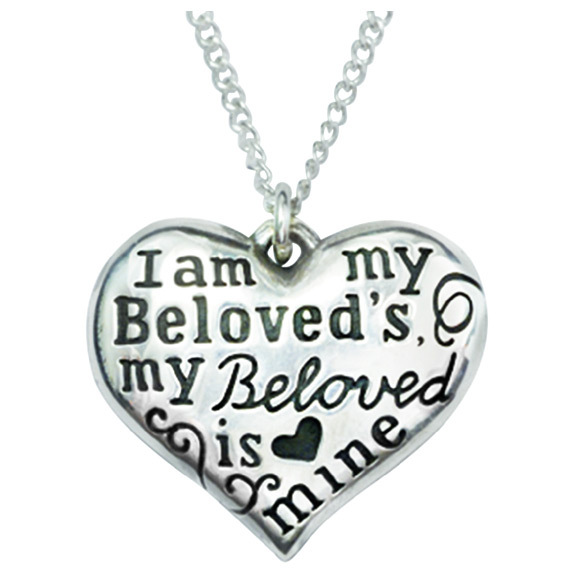 The I am my beloved's heart necklace measures 13/16" wide x 11/16" tall. Includes 18" .925 sterling silver curb chain necklace to match. "I am my beloved's, and my beloved is mine: he feedeth among the lilies" (Song of Solomon 6:3). We guarantee our I Am My Beloved's Heart Necklace in Sterling Silver to be high quality, authentic jewelry, as described above.